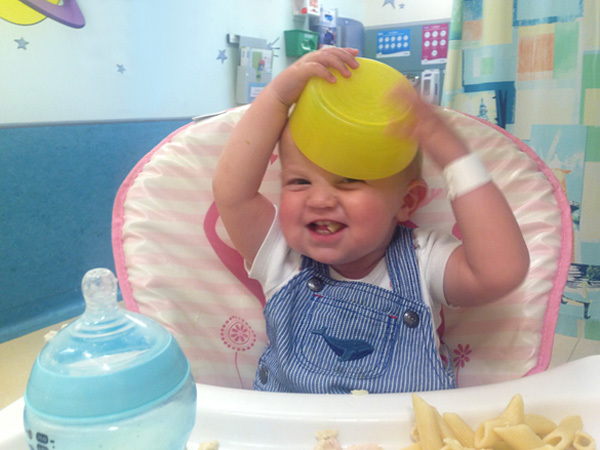 On July 19th Adrian had a routine appointment at the renal clinic of our local hospital. The consultant nephrologist from Nottingham – Dr Evans comes down every three months to run this shared clinic. We were pretty happy with Adrian’s progress and growth in general, and had no particular concerns aside from the UTI that Adrian had experienced in May/June. Dr Evans however seemed very concerned that Adrian’s creatinine and urea levels were still very high following the elevations that were caused by the UTI. He mentioned that there may be some procedures that could be attempted to assist getting his toxic levels down. 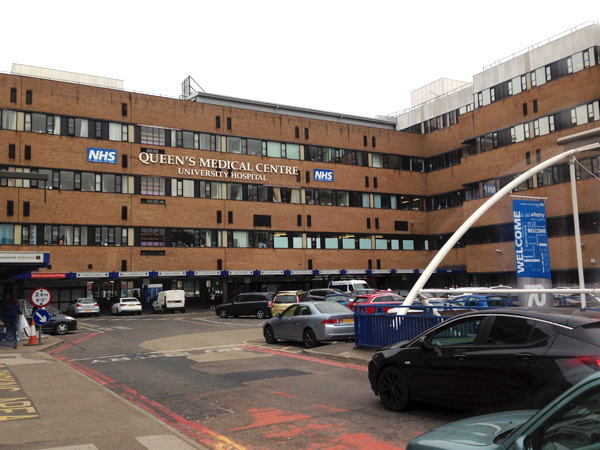 Dr Evans rang his colleague Mr Shenoy – Consultant Urologist/surgeon at QMC in Nottingham to see if Adrian could be seen, and another call secured him a bed on ward E17 for that very same night. We left clinic in a startled daze, with me wondering how on earth I could get everything together quickly and travel the four-hour journey to Nottingham at such short notice. My boys had been collected from their schools by Grandparents, but still had another day at school before the holidays began. My mind raced with all the little jobs that needed to be completed before I could get on the road. I’d never left either of the older boys for more than one night, it felt heart wrenching that I couldn’t be there for them all simultaneously. On our way home from clinic we stopped off at Tesco for supplies. Nappies, milk, and food were loaded into the car in a flurry, then back home to pack whatever was clean. Adrian was ready for bed by the time I finally set off at around 8pm, and fortunately he slept throughout most of the 170 mile trip up to Nottingham. I pulled into the car park at 11.50pm and to be met by what seemed like cute little bunnies in my headlights. Adrian was just rousing as I began to unload the pushchair and piles of bags. In spite of the late hour it was incredibly hot, I’d driven up in a summer dress and sandals which suddenly felt insubstantial upon recognising that one of the bunnies nearby was indeed a ravenous rat in search of discarded food. 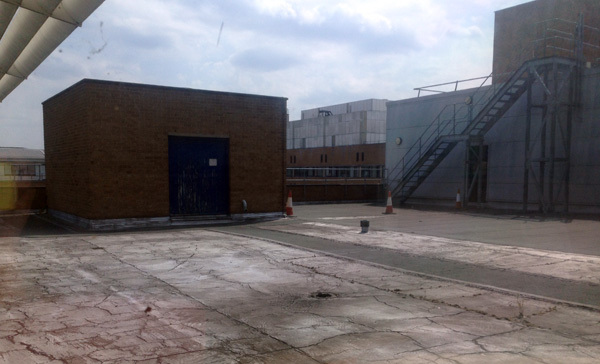 Soldiering on, Adrian and I made it up one level on the dark spiral ramp and around to the main entrance of QMC. I followed the hospital signs into west block and took the lifts up to E floor, finally making it onto ward E17 shortly after midnight. On the ward we were met with a pleasant welcome in spite of our anti social arrival time, we got shown to Adrian’s cot in the darkened and sleepy bay and left to settle. Except the settling part didn’t really work out well. Adrian was replenished from his nice long sleep and had awoken to the excitement of being carted through an alien environment, he was totally wired, eyes like saucers, seeking out his new surroundings. He spotted a giraffe picture on the wall and let out an excited, ear-splitting shriek. An elephant picture on the adjacent wall, sent him wildly squealing and pipping, and no amount of soothing seemed to shush his little lungs. A nurse soon appeared to begin the admittance paperwork, thankfully choosing the parents sitting room to contain Adrian’s voice a little. Back in our bay Adrian’s excitement went up to a new level. I tried everything I could think of to quiet him down, but was becoming quite distressed myself. It was so hot up there, and being on the fifth floor turned out to be quite a big deal to me. Leaving our insular little life and well trodden tracks in Suffolk and entering ward E17 at QMC was a big shock for both me and Adrian. I’m pretty sure that no one on the ward managed to get any sleep until we had been ASBOed off the main bay, and into an empty double bay at the far end of the Ward. I was thankful that Adrian’s sleep disruptive shouts were distanced from the poorly children at last, and by about 3am Adrian and I finally managed to get some rest. Friday morning got off to a good start, with me arranging our things, eating our breakfast and meeting the day staff. Later, during doctors ward rounds I met Dr Lunn for the first time. Dr Lunn is a consultant pediatric nephrologist who works as part of the senior renal team alongside Dr. Evans, Dr. Malik, and Dr. Christian at Nottingham Children’s Hospital. He explained to me that it was planned that Adrian would be fitted with a catheter to freely drain his bladder, releasing any possible pressure that takes place during the filling and emptying processes. It was unclear which type of catheter would be fitted yet, it would depend on the notes from Adrian’s previous tubal investigations. The surgeon would be contacted and in the mean time a review renal ultrasound scan was booked for the afternoon. 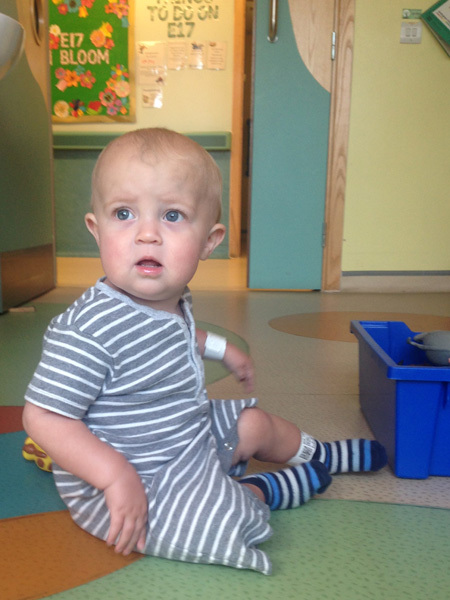 Adrian’s renal scan was a bit of a disaster, he was very upset and awkward throughout. 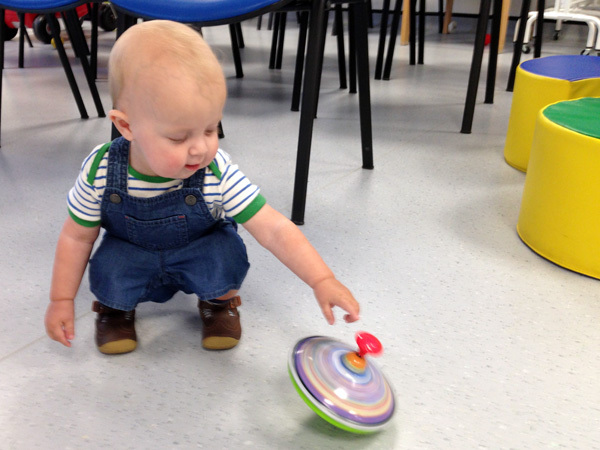 Wriggling and writhing about in spite of plenty of input from myself and the play specialist. The sonographer managed to get the images she needed, but the whole process was a traumatic struggle. 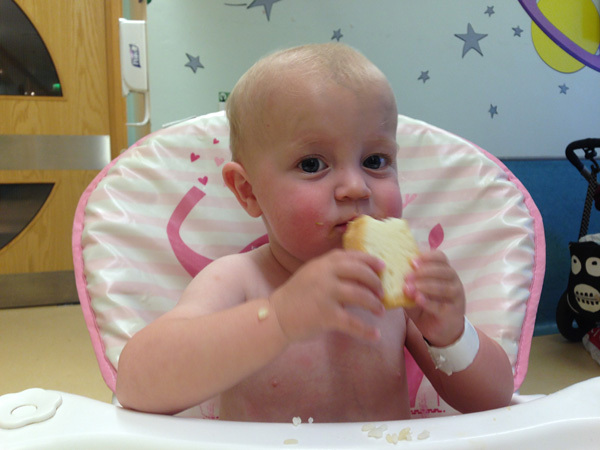 Later the images came back to show that Adrian’s kidney, bladder and tubes was very much as before. The remaining organ with large cystic chamber, his bladder small and thickened. Dr Lunn returned to the ward in the afternoon to explain the results of the scan and told me that Adrian would be discussed and seen by Mr Shenoy upon his return on Monday. I don’t mind admitting that I found it incredibly frustrating and alarming to have been thrown unexpectedly into a hospital stay. The very thought of staying and waiting another two days on ward until we knew more sent me into panic, and I found the rest of Friday a real trial. Adrian was fit and well, full of beans and seemed to be having a sensory overload. It was boiling hot that week too, and the ward felt stuffy and claustrophobic because of its fifth floor level and lack of opening windows. 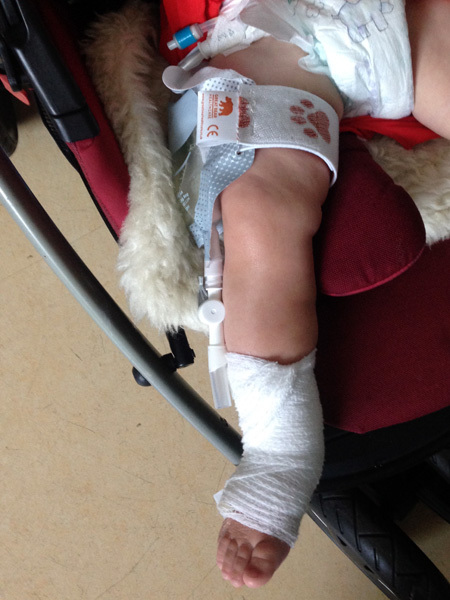 Adrian’s cot was metal and all his athletics caused a bump and bruise on his forehead. The playroom had similarly hard edges to the tables and furniture, it was very difficult to contain him both happily and safely in that environment and I spent many hours carrying him around and rocking him in the evening. On Saturday we managed to escape the ward a couple of times. I had shared my despair with several of the nurses, who may well have found me to be slightly manic. I certainly came across as a neurotic mess, blubbing about my little family I had left behind. All the staff on E17 were very supportive but I was incredibly homesick and probably still in shock. My older boys at home were constantly at the forefront of my mind, and by saturday I was missing them like crazy. The last time I’d seen them I’d been panicking madly about the long journey and we didn’t have much of a farewell. When I looked at photos of them on my phone I cried like a baby. Nursing staff were just doing four hourly observations of Adrian over the weekend, along with his usual meds. They were kind enough to let us off ward for a stroll which helped pass the time away as well as giving me the chance to collect supplies from the car and local shop. 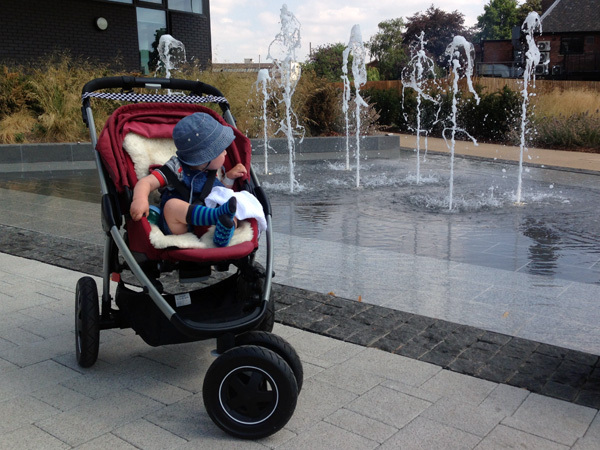 We went off site for a little explore, found some fountains and a bit of shade under the trees at the University of Nottingham Campus. One real positive about being on ward E17 was ordering Adrian’s meals from their specialist renal menu. It was nice to have a break from being tied to our kitchen, on high alert, cooking certain foods to avoid further damage his kidney. 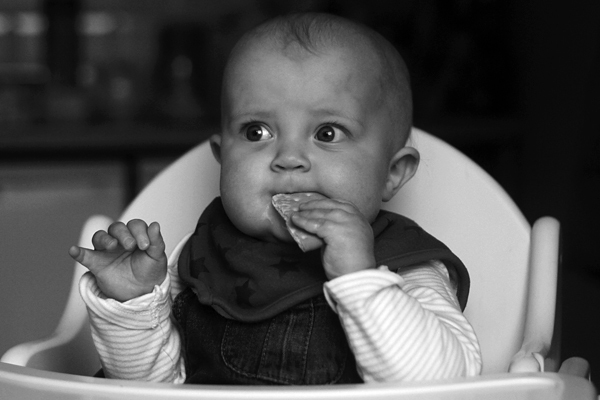 Low potassium, sodium and phosphate is hard work, especially for babies. The renal menu on ward E17 seemed incredibly extensive compared to the very limited set of food that Adrian had become accustomed to at home. He tried renal minced beef, mashed potatoes and his first ever brain freeze from ice cream! Looking back at my photos from the trip I see mostly a very happy lad in a high chair. Perhaps because it was one of the few hours that I wasn’t either holding him, or trying to catch him. 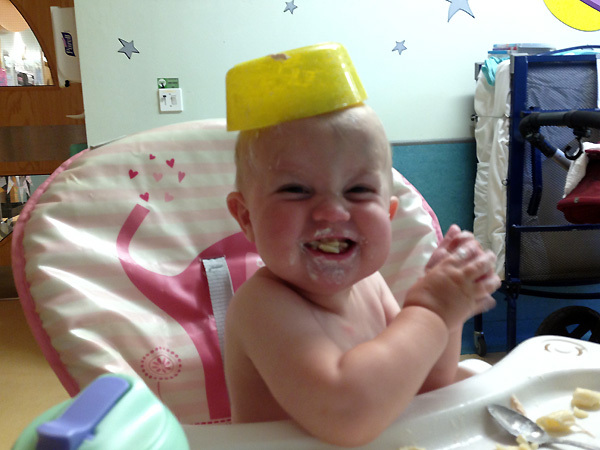 Every new mealtime bowl became a hat. That was something that Adrian learned up on E17 that week. 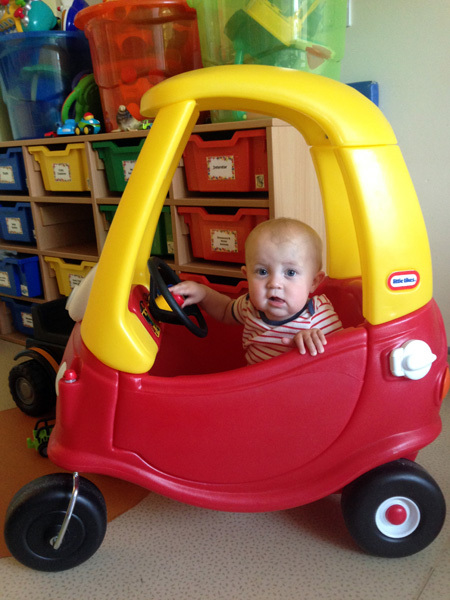 Along with how to do a forward roll in his metal cot, and appropriately timed waving… so much waving. On Sunday Adrian and I ventured further afield. After his Obs and bloods had been done we went off for a walk to the supermarket using the GPS on my phone. The walk was pleasant enough, taking in some beautiful,l turn of the (last) century architecture along pretty streets. Unfortunately the google maps app led me to a Tesco Express store rather than the mega store I’d had in mind for supplies. A quick chat with a some locals then led me off towards Sainsburys. I never did find it, but managed to skirt various sights of Nottingham that I’d had no idea existed. Canal boats, the rocky castle surround and all of a sudden the city centre itself, bustling in spite of it being Sunday. 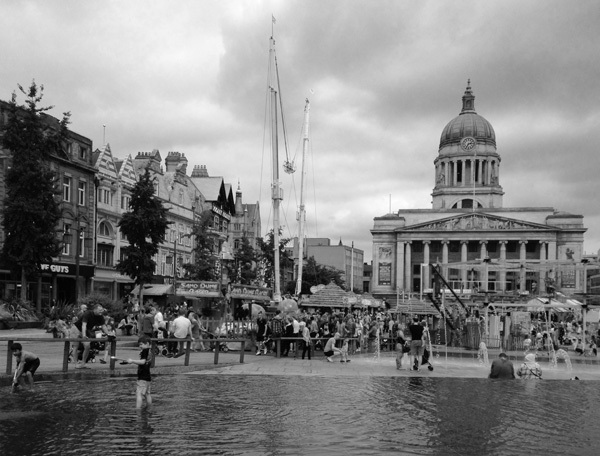 We saw trams and buses aplenty, fairground rides, synthetic beach and the iconic Nottingham Council House. We spent an hour or so stocking up on clothes, flip-flops and amusing things to take back to the ward. It was a pretty long walk back to QMC from the centre and I relied on various strangers directions. I didn’t see a single thing that was the same as my outward stroll, so perhaps I did a big loop in the three and a half hours I was walking. I certainly felt I’d had a decent taste of Nottingham. Monday morning brought us a visit from My Shenoy along with a large team. He explained how he planned for Adrian to have a urethral catheter inserted because he’d checked his notes from Adrian’s cystoscopy in April and he said there were no strictures. He went on to say that Adrian’s Creatine levels would be closely monitored through blood tests for a significant decrease. If the free draining of Adrian’s bladder showed an improvement in his kidney function, a further operation could be considered to relieve the pressure on the bladder whilst still offering some urine output in the usual way. Mr Shenoy explained how he could bring both ends of one of his ureters to the surface of Adrian’s abdomen which would empty into a stoma bag. The other ureter would remain intact and it would relieve pressure whilst avoiding Adrian’s system becoming dry. It all sounded frighteningly imminent, with the catheter planned to be inserted later that day under sedation. A doctor came to take bloods and insert a cannula for Adrian’s sedative to be given. His poor little hands have no accessible veins anymore but thankfully it went into his foot instead after quite a lot of attempts and the inevitable wailing that went with it. Later we went back into the treatment room for the catheter to be inserted. Adrian was linked up to the sats machine, given an IV sedative and entertained while the meds did their work. The doctor prepared her catheter kit, with several nurses to assist. Nothing prepared me for having to watch my little man having a catheter inserted. He shouted out and cried in spite of his sedative, and feeling helpless I had a good cry too. A catheter bag was attached to a leg strap and I was taught how and when to empty it on ward. Because of Adrian’s short stature the bag’s valve reached all the way down to his ankle… so long he could’ve tucked it in his sock! In spite of his obvious distress when inserted, his catheter and bag didn’t seem to immobile him in any way at all. Keeping him safe on ward was even more tricky. Later on Monday I escaped the ward for an hour with Adrian resting up in his pram and ate my first hot meal since Wednesday. We went down a floor to the hospital restaurant and I replenished my own electrolytes. Now it was a waiting game until the next set of blood tests, and observing any possible improvements to Adrian’s high creatinine levels. 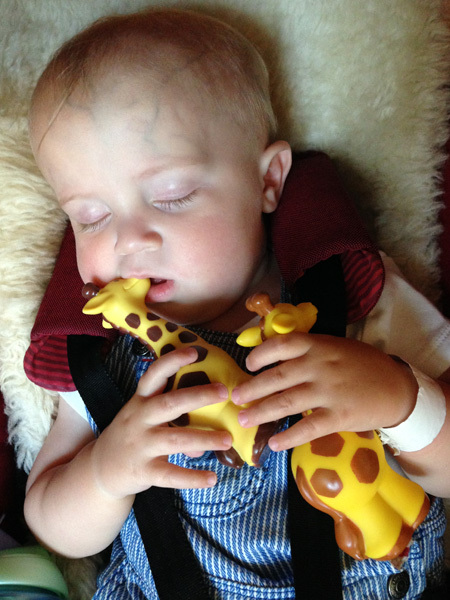 Did I mention Adrian loves Giraffes? 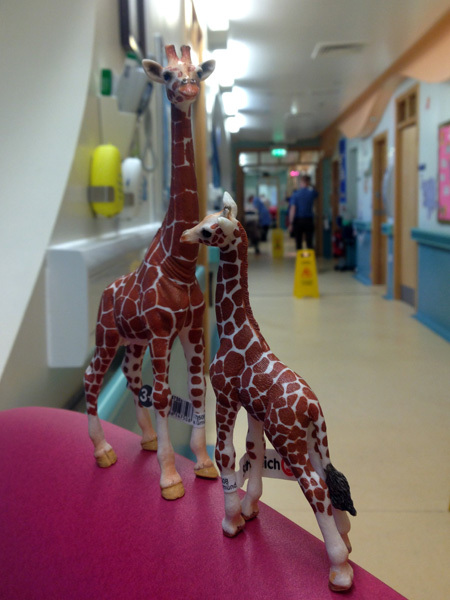 I think we spent the next couple of days trying to find every giraffe in the E17 playroom. Along with books about giraffes, the toys were not in short supply. Duplo, Fisher Price and realistic looking versions were gathered up, carried around and hugged. Doctors rounds on Wednesday brought a pleasant surprise. I was told that we could finally be discharged with Adrian’s indwelling catheter tube draining into a double nappy. His blood tests would be taken at home by our community team and follow-up clinic in Nottingham would be in 4-6 weeks time. It was the news I’d been hoping to hear for days, which had actually seemed more like weeks, and yet it was bittersweet. 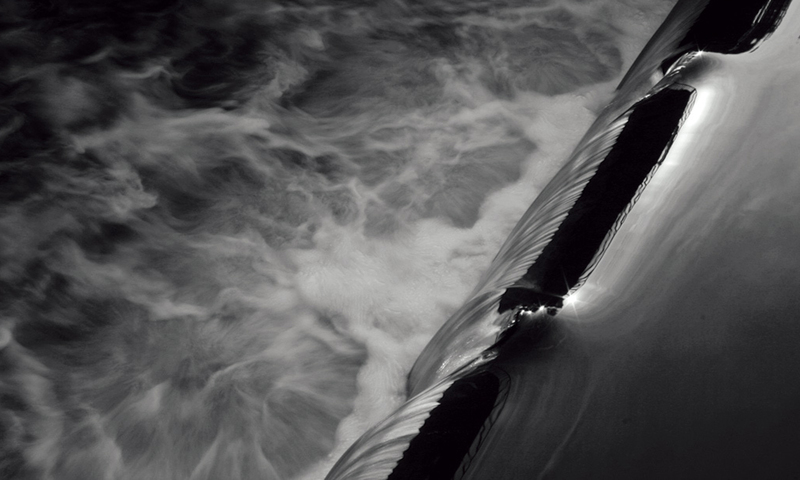 I had seen so many distressingly real snippets of other people’s lives and families at QMC. The place is huge and seems to have a timezone and airspace of its own, painful moments tumbling headlong into each other, charged with emotion and then frustratingly long still pauses in between. The parents I’d met up on E17 had so many stories of their time in Nottingham. Nothing had prepared me for being there amongst those chronically ill children and their families. 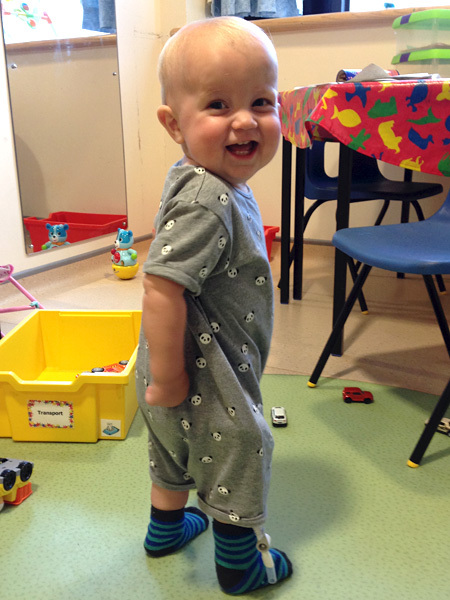 Adrian’s CKD had been controlled so well with medication and diet, hospital treatment had seemed somewhere off in the future. The reality of seeing the clinical intervention and invasive life saving operations taking place in real-time at QMC brought our future together into a clearer view. I left Nottingham feeling changed in some ways, I don’t think it was hardened, perhaps just resigned. People have been telling me I am strong and brave to deal with all the extra care and concern that Adrian’s CKD brings. The truth is I’m neither. I do these things for Adrian because they have to be done, even if I don’t always quite believe they can be. Driving unplanned to Nottingham happened because it had to happen. I spent the hours that led up to leaving upset, crying and feeling that I simply couldn’t do it. No bravery involved. 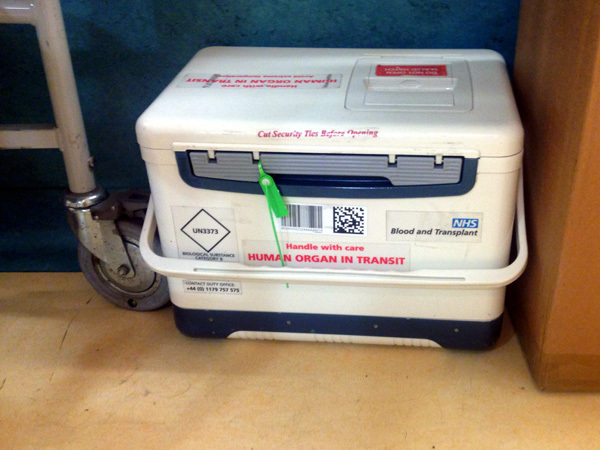 On the ward when I saw the transplant cool box waiting near the doors, my mind became a morbid tangle of pessimistic thoughts. Along with a strong overprotective feeling for my baby’s tiny body. I’m not even attempting to put a brave face on this journey. It’s Adrian’s story, and during that particular week , some terrifying possibilities of his future came into stark focus.